The Honourable Vance Amory, senior minister in the federal government of St Kitts and Nevis, is leading a delegation to the 29th Inter-sessional Meeting of CARICOM Heads in Port-au-Prince, Haiti. The two-day meeting started today and will deliberate issues of critical importance to the region: disaster management, crime and security, blacklisting and de-risking, trade and CSME. Some of these issues continue to adversely affect the economies of small island developing states and the region will seek to combine its efforts and resources to continue to collectively advocate for inclusion of these matters on the international agenda and in the multilateral arena. Making an intervention on the agenda item of disaster management on the first day, Minister Amory reiterated the need for governments to take a strategic and systematic approach to prepare its citizens to mitigate the effects of natural disasters. He enumerated some best practices that the Team Unity government has endorsed to ensure the safety of its citizens during catastrophic disasters such as hurricanes Irma and Maria. The St. Kitts and Nevis head of delegation explained that the National Emergency Management Agency (NEMA) continues to engage in vigorous awareness and sensitization campaigns to educate communities about their responsibility and safety measures they can take before, during and after storms. Amory also shared that during the last hurricane season, the National Emergency Operations Committee (NEOC) monitored the storm and mobilised emergency responders and resources. 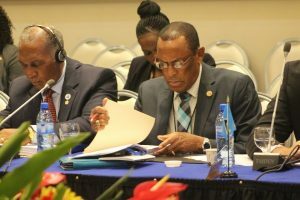 Addressing the matter of CDEMA’s continuing leading role in the region in disaster management, he called for greater support by member states to its programme and resources. Among the heads attending the meeting are those of Barbados, the Bahamas, Grenada, Haiti, Jamaica, St. Lucia, and Trinidad and Tobago. Other countries are represented by the deputy president (Guyana) or ministers (Dominica, St. Kitts and Nevis, the British Virgin Islands, Montserrat, and Suriname). Ambassador Colin Murdoch is leading the delegation of Antigua and Barbuda. The discussions have been frank in the plenary and items discussed in caucus included Clico/Baico, West Indies cricket, crime and security and the assessment report regarding Jamaica’s relationship with the CARICOM. Other members of the St. Kitts and Nevis delegation include Kaye Bass, permanent secretary in the Ministry of Foreign Affairs, and His Excellency Sidney Osborne, ambassador to CARICOM.